Located in the heart of downtown Miami, across from Bayside Marketplace, with over 96 specialty stores and 14 renowned restaurants. Overlooking Miami's Biscayne Bay, the Holiday Inn is just minutes away from the Port of Miami, American Airlines Arena, and the Performing Arts Center. Business guests will appreciate our proximity to Miami's government centers, financial district, banks, accounting and import/export firms. Our entire staff takes pride in providing a friendly and pleasant environment. 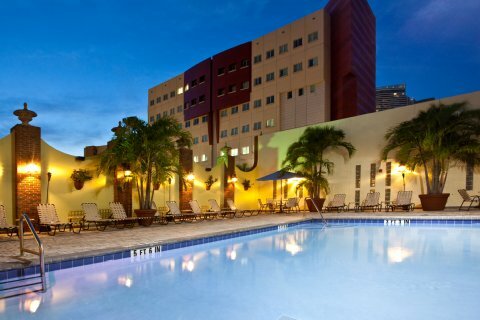 We would like the opportunity to host your next visit to Miami This hotel is committed to providing accessible facilities under the American Disabilities Act. If your accessibility needs are not met, please contact the Hotel Manager on Duty. Should you require additional information regarding accessible facilities for guests with disabilities, please call 1-800-Holiday (U.S. and Canada) or contact the hotel directly. For the hearing impaired, TDD service is available at 1-800-238-5544 within the U.S. and Canada.